Minnesota Rising: You're Invited: Jeremiah Program's Late Night Leap! You're Invited: Jeremiah Program's Late Night Leap! Minnesota Rising is pleased to collaborate with Network Partners, emerging leader group organizations, to help cross-promote our parallel efforts to provide leadership development and community-building. Below, we highlight PROPEL, the Jeremiah Program's Young Professionals Group, which invites you to participate in this weekend's Late Night Leap! 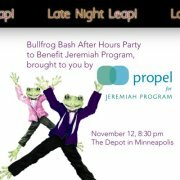 Bullfrog Bash After Hours Party to benefit Jeremiah Program!